Manager Andre Johnson takes an order from Joshua Carlson of Swartz Creek while PIC Kevin Johnson and Jay Topham make sandwiches behind the counter. 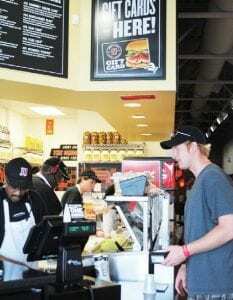 — With the slogan of “Subs so fast you’ll freak,” Jimmy John’s keeps customers happy at its newest Genesee County, 3292 S. Linden Rd. 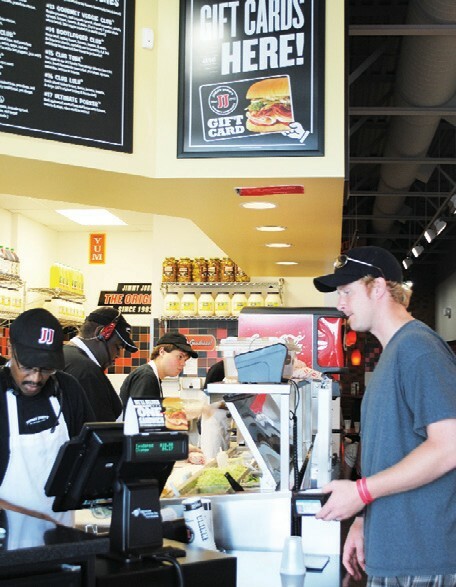 Jimmy John’s offers several sandwich choices, including Plain Slims for $3.50, eight-inch subs for $4.50, giant club sandwiches $5.50, the JJ Unwich, which is a low-carb lettuce wrap, and The J.J. Gargantuan for $8. Walsh said the store’s freshly-baked bread and speed set it apart from other sandwich restaurants. “Everything is fresh. We slice all of our items everyday and we can make a sandwich in less than 30 seconds,” she said. The most popular items on the menu are the #9 — Italian Night Club and #12 — Beach Club. The oddest combination ordered by a customer was a gargantuan with bacon and tuna, Walsh said. In addition to sandwiches, patrons can order from a variety of sides, including potato chips, kosher dill pickle, extra meat and/or cheese, hot peppers or a giant chocolate chip or oatmeal raisin cookie. For those not wanting to come into the restaurant, Jimmy John’s offers drive-thru service, catering and delivery within a five-minute radius. Orders also can be placed online at www.jimmyjohns. The Flint Township store employs 20 people, including manager Andre Johnson and PICs (persons-in-charge aka assistant managers) Erin Brott and Kevin Johnson. “It’s a great store and I have great employees,” Walsh said. Hours are 11 a.m.-9 p.m. Monday- Sunday. For more information, call 810- 732-7000.